Femoroacetabular impingement (FAI) is a bony abnormality of the hip joint that can lead to painful cartilage damage (both labrum and articular cartilage) among adolescents and adults, and subsequently leads to osteoarthritis. (Related Study: Femoroacetabular Impingement in Athletes: Current Concepts) The cause of this disorder is not completely understood but probably represents a combination of genetics, development, and overuse. Not everyone with bony features of FAI are destined to have the same amount of problems and, in fact, some people with this condition may remain physically active their entire lives without developing problems. There are three common types of FAI: Pincer, Cam, and Combined. Pincer impingement occurs because the acetabulum (hip socket) is too deep or rotated forward causing the labrum to get crushed between its rim and the neck of the femur (thigh bone) when the hip is flexed up. Cam impingement occurs because the femoral head (ball part of the ball-and-socket joint) is out of round, so it does not rotate smoothly inside the socket. This is characterized by bony buildup or a bump along the margin of the femoral head. With hip flexion, this bump rotates incongruently through the socket, shearing off the articular cartilage of the acetabulum. Most cases of FAI represent a combination of both pincer and cam. Joint damage from FAI occurs with hip flexion. 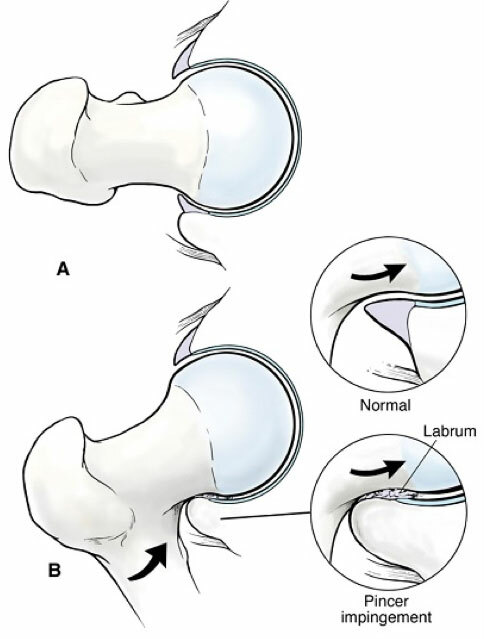 Cam (Top): The femoral head bump of the Cam lesion glides underneath the labrum and engages against the edge of the acetabular articular cartilage, resulting in shearing and carpet-type delamination. Pincer (Left): The prominent acetabular rim of the Pincer lesion crushes the labrum against the femoral. FAI is like the front end of your car being out of alignment, leading to uneven tread wear. When the tread starts to flip off, that is when symptoms start to occur. How quickly and severely the damage occurs depends on each individual’s driving habits. Adolescents and young adults developing this problem are almost always involved in sports or physically demanding activities. (Related Study: Arthroscopic Management of Femoroacetabular Impingement in Adolescents) The problem is not so much the sport or the activity but simply the way the hip is formed, with the activity bringing it to a head at a younger age. (Related Study: Femoroacetabular Impingement in Adolescent Athletes: Outcomes of Arthroscopic Management) Thus, the focus of treatment is not so much just how quickly one can get back to sports or activities as much as understanding the long-term ramifications and trying to assure the best possible long-term outlook. The onset of symptoms associated with FAI may be sudden or just occur gradually over time. Regardless of how the symptoms occur, the problem is still just the culmination of chronic, cyclical, submaximal loading of the joint, gradually developing over time from a process that is present since the age of nine or ten. That is why it is common that individuals may present with recent onset of symptoms, but their imaging studies indicate a longstanding process. FAI problems include a variable combination of damage to the labrum and articular cartilage. Articular cartilage of the acetabulum is especially vulnerable to damage from the cam bump. The articular cartilage has very few nerve endings, and thus the damage can be quite severe before symptoms even start to develop. For this reason, professor Ganz, who authored the concept of FAI, coined cam impingement as the silent killer of the hip. In contrast, the labrum has a generous pattern of nerve endings such that labral tears tend to be quite painful. With cam impingement, symptoms may only begin to occur when the labrum starts to fail, long after the articular damage has advanced. With pincer impingement, the labrum tends to fail earlier where it is crushed by the rim of bone. In young people, the labrum is a hardy structure and can sometimes withstand crushing from the pincer lesion for years before it actually tears. This results in circumstances where painful disabling symptoms may be present for a longtime before an MRI shows evidence that the labrum is actually torn. The labrum may be crying wolf long before it tears. FAI is not as simple as just pincer or cam or combinations of both. Numerous other factors come into play, contributing to FAI problems. Rotational features of the lower extremity (femoral version) and features of the lumbar spine, including reduced normal lordosis (flat back) or hyper lordosis (sway backed), just to mention a few, can both negatively and positively influence the FAI problem. It is not just a static feature of the bony architecture of the hip. There is a significant dynamic component to how the joint edges collide, and these can be influenced by other body parts. Isolated FAI problems, without other secondary features going on, are actually uncommon. There are reasons for this observation. First, the body is compensating for the FAI condition long before joint damage and pain occurs. Second, symptoms associated with the joint damage are not always obvious, and may be present for a long time before being detected. In fact, it is common that patients may have made trips to several different physicians before an accurate diagnosis is reached. This delay in diagnosis results in more opportunity for secondary problems to set in. For the physician, it is important to maintain a sense of awareness and suspicion for potential underlying FAI problems, as the secondary compensatory problems may be more obvious on examination, and may obscure the presence of an underlying FAI disorder. Most specifically, a frequent feature of FAI is reduced rotational motion of the hip, especially inward rotation. This is attributed to the shape of the joint where bony collision occurs between the bump on the femoral head and/or the protuberance of the rim of the acetabulum. These restrictions may result in compensatory problems long before joint damage occurs and the hip starts to become painful. Most commonly, these compensatory problems manifest as groin, low back, or gluteal muscle symptoms. Hip symptoms commonly emanate from the groin; although sometimes symptoms may occur along the side of the hip, and occasionally even in the buttock region. The classic Impingement Test elicits pain bringin the flexed hip across the body in internal rotation. With FAI, internal rotation is often limited. Joint problems will typically cause pain in the front of the hip, but that is different than groin tenderness. Groin tenderness can be associated with overworking of the muscle and tendon structures that attach along the front of the pelvis. These are commonly grouped as “core muscle injuries” or “athletic pubalgia” or “sports hernias.” Reduced motion of the hip is compensated by increased pelvic motion, which puts more stress on the pelvic stabilizer muscle groups. As these muscles become overworked, it results in discomfort and dysfunction in this area. Similarly, limited hip motion can result in more compensatory motion of the lumbar spine, resulting in greater susceptibility to low back problems. The gluteal muscles are important stabilizers of the hip along the side and the back of the joint and get overworked when trying to protect the hip. On exam, tenderness in these soft tissues along the side or back can obscure the presence of a joint problem and often get attributed to gluteal tendonitis or even erroneously diagnosed as bursitis.